When it comes to Landscape Design in Green Bay, Door County or anywhere else in Northeast Wisconsin, great landscape design is often the key. The landscape designers at Landscape Renaissance have been enhancing outdoor spaces through artistic design and creativity for years, and we’re here to make your yard look its very best. Natural Lawn Care & Ecological restoration: Sometimes all your lawn and landscape needs is some tender loving care. We use natural and organic based fertilizers and biological soil building products to give your lawn and landscape safe and sustainable nutrients. Our licensed staff can also provide weed control products. 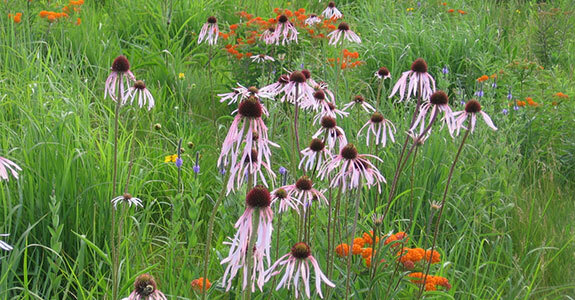 If you dealing with large or unwanted lawn or grass areas, our services in ecological restoration in Green Bay and Northeast Wisconsin will transform your high maintenance lawns into a vibrant wildflower and prairie habitat. We can custom design your native habitat. 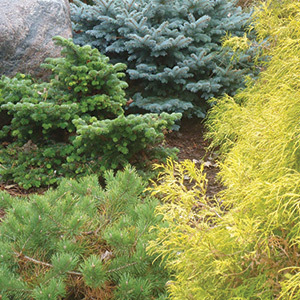 Planting plans and installation: Through the design process, we develop plans which incorporate perennials, shrubs, trees, bulbs and annual plants into your outdoor living area. Using a variety of plants creates an excellent way to increase both the visual appeal and the comfort level of the yard. Our experienced staff will take care of all the work for you. We have access to thousands of plant choices and top quality plant materials to make your outdoor living area more vibrant, healthier and beautiful. Hardscapes & Landscape Lighting: Greenery isn’t our only specialty. Our landscape staff have a vast knowledge and the tools to make functional and creative patios and walkways. We work with types of products from natural stone and clay pavers to high quality concrete pavements. Low voltage landscape lighting can enhance the overall look of outdoor spaces. Illuminate walkways, highlight specimen trees or show off your new patio when you take advantage of our professional landscape lighting services. Whether you’re in need of ecological restoration for your property or your backyard could just benefit from tree installation, you’ll be happy to know that Landscape Renaissance can take care of all of your landscaping needs. We have much more than just a green thumb. We work with care and use our vast knowledge of design to bring every element of greenery, lighting and stonework together to create an attractive outdoor landscape.